This is getting serious! Hubby and I decided since we will be running a 5k and in general trying to actually jog that we needed real shoes that are made to do the job! These are what I got, Saucony Ride 7. The picture doesn't do them justice as the colors are a lot brighter. The yellow is very neon. Brian got a different brand and his are neon orange. They didn't have black ones in his size but he says he's ok with the orange. As for me, I'm just glad mine are not hot pink! They are going to take a bit for me to get used to as I've not worn shoes that actually have laces in a couple of years. Plus these go up around my ankle more (as they should) than what I am used to. It's new all around but I am determined! 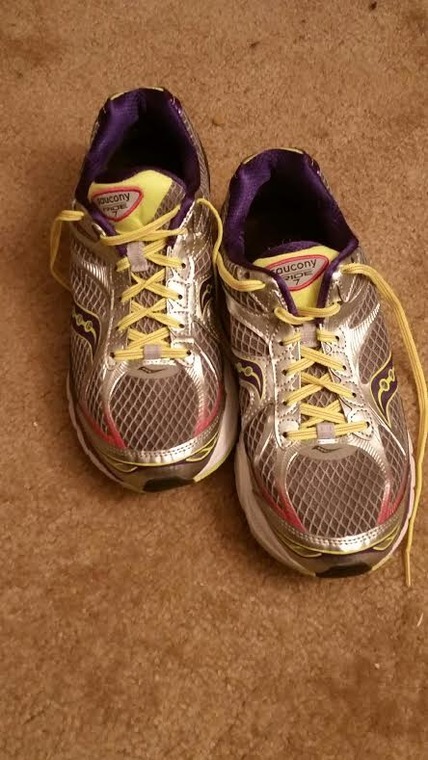 I actually jogged a very short distance in them last night and was happy that I was able to. It's been so long since I've tried to do any running that I wasn't sure my body would remember how! But it did. So soon we'll be starting a C25K program to get us up to being able to at least job a full 5k even if we can't flat out run it.